Carbon emissions are dissolving the seafloor, especially in the Northern Atlantic Ocean. Shown here, Azkorri beach in Basque Country in northern Spain. Excess carbon dioxide isn't just building up in the atmosphere – the oceans are holding onto more of the stuff too, fizzing them up like soda. As the seas get warmer and more acidic, all kinds of havoc is wrought, and now a new study has identified yet another symptom. Researchers at Princeton and McGill Universities have found that the seafloor is beginning to dissolve as a result of human activity. 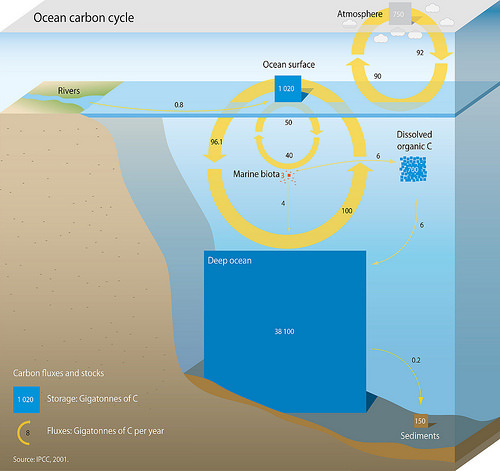 According to the Smithsonian's Ocean Portal organization, about 525 billion tons of CO2 has been absorbed by the world's oceans since the beginning of the industrial era, making seawater up to 30 percent more acidic than it was 200 years ago. That makes it the fastest known change in ocean chemistry in 50 million years or so, and the effects have already been devastating. Ocean acidification is contributing to coral bleaching, upsetting predator/prey relationships, messing with the survival instincts of fish, and even dissolving certain sea creatures. And now we have a new problem to add to the ever-growing list: pockets of acidic water are reaching the bottom of the ocean and destroying the seabed. A healthy seafloor is made mostly of calcite, which comes from the decomposed remains of plankton and other sea creatures. But increased CO2 levels are quickly ramping up the acidity and eating away at the calcite. In the worst hit areas, such as the Northern Atlantic and the southern oceans, the normally chalky-white material is becoming a muddy brown color. The new study investigated the extent of the dissolving seafloor, and how much blame belongs to human influence. Basically, the deepest parts of the sea are already fairly acidic, thanks to higher pressure, lower temperature and stored CO2. But closer to the surface, conditions are less hostile, meaning calcium carbonate particles will accumulate on the seafloor at shallower depths. The point where the two transition is called the calcite compensation depth (CCD). This depth is one of the main metrics of seafloor dissolution, since anything below that point will dissolve. The study examined recent databases of bottom-water chemistry and other conditions in the western North Atlantic Ocean, and found that the CCD there has risen by about 300 m (984 ft) since the beginning of the industrial era. In the lab the team recreated the seafloor at different depths, to get a better understanding of what factors influence the dissolution of calcite. By modeling and comparing the rates of seafloor dissolution from preindustrial and modern times, the team was able to calculate the amount that can be classed as human-induced. In the Northern Atlantic, this was between 40 and 100 percent. "For decades we have been monitoring the increasing levels of anthropogenic carbon dioxide as it moves from the atmosphere into the abyssal ocean," says Robert Key, co-author of the study. "While expected, it is none the less remarkable that we can now document a direct influence of that process on carbonate sediments. It will be really interesting to see if we can further support this result with new data generated by autonomous floats in the Southern Ocean."